Seriously, cooking cannot be any easier than this super quick yet delicious French grilled watermelon recipe. Yes, you can grill this wonderful, refreshing fruit. Grilled watermelon has a smoky quality and an intensified sweetness, all at the same time. A perfect melding of summer's flavors, the result is truly splendid. This grilled watermelon recipe is easy to prepare and lends its slightly exotic flavor to a variety of different dishes. Enjoy it as-is, straight from the grill, hot, smoky, and refreshing. Or put it into a traditional fruit salad and drizzle it with a sweet honey lemon sauce for dessert. Alternately, you can enjoy grilled watermelon as part of a savory dish. Combine it with different cheeses, vinaigrettes, and salad ingredients for an elegant twist on the summer staple. Wash the watermelon rind, cut the melon lengthwise, and then slice it into 1 1/4 inch thick wedges. Trim off and discard the rind. Salt the prepared watermelon and allow it to rest on a wire rack with paper towels placed underneath for approximately 20 minutes. After this time, rinse off the salt on all the surfaces of the melon pieces making sure you have removed it all, you do not want to taste the salt, and firmly pat them dry with clean paper towels. Brush the watermelon pieces all over with the olive oil. Place them on a preheated grill over medium-high heat and cook them for 3 minutes on each side, until grill marks appear. 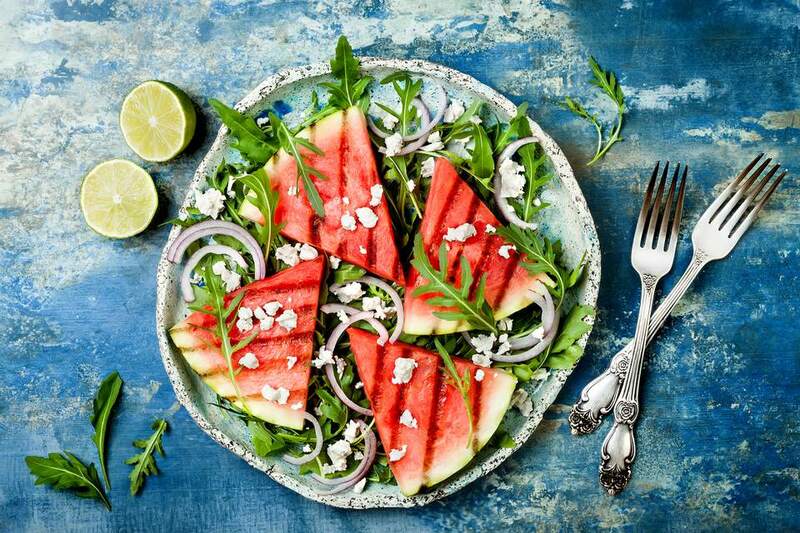 Do not place on a too hot grill or the watermelon will simply scorch rather than heating through and taking on the smoked flavor (the reason for preparing this dish). Serve the grilled watermelon immediately to your guests or use in some of the suggestions below. Whichever you choose, you will be making this dish over and over. Learning to grill watermelon means the options are endless. Place the grilled watermelon and goat's cheese on a bed of mixed greens and drizzle the salad with a berry-based vinaigrette. Chopped the grilled watermelon into smaller cubes and toss them with black olives, feta cheese, and vinaigrette. Serve the grilled watermelon with a few, thin slices of jalapeno chili pepper, a squirt of fresh lime juice, and a small dash of sea salt. Add grilled watermelon pieces to a tropical fruit salad for a slightly different flavor.